Panic Action Is Over? Time for Just Plain Panic Mode! My car has been destolen. It is at the shop for repairs. I have a rental car. The contents were intact. Cute Boy Person is back and I finally got some time with him last night. I thought I'd been lucky avoiding a PTSD flare up when I easily could have felt violated by the theft of my car 2 parking spots from my door. Then I crawled into bed with him where it was safe. "Safe," my brain said. "I can relax now. I can let go. I can decelerate out of action mode." I didn't realize it at first. I have nightmares when I'm hot and I was hot. I was sweaty. I had gas cramps. I had nightmare after nightmare. I thought that it was the pain and the heat but I didn't remember the content of the nightmares when I woke up. Then I came home and took a nap. In my dream, someone stole my car. So I got a rental car and someone stole that. I knew which car was theirs so I stole it to track them down. I stopped at an auto repair shop and the car I was in was stolen. I walked to the diner next door. The emergency broadcast network cut in on the diner's radio and tv. 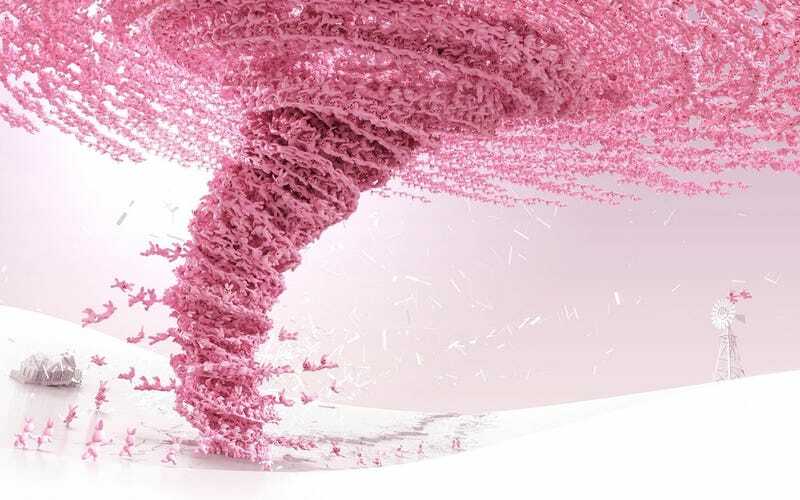 A pair of incredibly rare, very dangerous pink tornadoes were coming through town. I looked outside and I could see them through the diner window. I started looking for a small room with no windows to take shelter in. Most of the doors were locked. I went to the repair shop. The thieves were there and I tried to get them to take shelter; they didn't care. Still, the doors to the back rooms were locked, so I ended up back in the diner, where my boss was. My boss (played by my landlord) was terrible, petty and mean, but when she saw one of the tornadoes coming down the block, we climbed under the table together. Someone climbed under the table with us but before I saw who it was, he said "it's ok."
That's when I realized that someone had grabbed my arm, the one closest to the window. I looked up and saw a man trying to get inside for shelter, reaching out for me to save him. I helped him inside and under the table with us. The man who said "It's ok" took my hand and I realized then who he was. It was Cute Boy Person, there to help me. The tornado passed the already broken window. I could feel the wind pressing down on my back, keeping me from breathing. All I could feel was the wind and CBP holding my hand.